Road Closure: Visitors approaching Cedar Rock from the south, Cedar Rapids area or I-380 please be advised that a road closure is impacting travel to the park. The local secondary roads department is replacing bridges on W35/Quasqueton Avenue between Walker and 290th Street. The road closure is anticipated to last the length of our tour season. Detour Information: Take I-380 to exit 43 S Independence/Vinton. Turn onto IA-150 N. Turn toward Rowley on 290th Street at the John Deere dealer, Bodensteiner, then head east through the edge of Rowley. At the stop sign with W35/Quasqueton Avenue turn north and go through Quasqueton heading left onto Quasqueton Diagonal Blvd at the fork in the road on the north edge of town, near the cemetery. Cedar Rock State Park is located about 1-mile north of Quasqueton on Quasqueton Diagonal Blvd. The Lowell House was featured in a USA Today article featuring Frank Lloyd Wright buildings around the country. CLICK HERE to view the full article as well as pictures of the home at Cedar Rock. I knew Frank Lloyd Wright's name before I knew anything about his work. Stepping through the door of Cedar Rock is like stepping through a portal in time. The Quasqueton home, built in 1950 by famed American architect Frank Lloyd Wright for Lowell and Anges Walter, is just as the Walters left it when they dedicated it to the state after Lowell’s death in 1981 — all of the furniture, decor, clothing and even knick knacks like personalized match boxes, tools, even a dog toy hanging in Lowell’s gun closet, are left where the Walters had them — as if frozen in time. Now owned by the Department of Natural Resources (DNR) and run as a state park, the home is maintained by state officials and open to to the public for tours during park hours. The park draws some 10,000 visitors each year from all over the world, said Katie Hund, park manager of Cedar Rock. Cedar Rock is one of hundreds of Frank Lloyd Wright’s unique and innovative designs across the United States, but is one of few to be left in its original form — including furniture and decorations Wright designed himself, Hund said. “No place is as completely original as this house,” said Jerry Reisinger, board member of the Friends of Cedar Rock, a nonprofit that raises money to maintain the property. “Even the plants are descendants of the originals,” Hund added. “They specified they wanted something nice, but not too nice,” Hund said. Although, the home would cost the Walters $150,000, which was about 30 times more than the average home of that era, she added. “That was a ton of money for a house back then, especially out here,” Reisinger agreed. Wright responded in only three sentences: he’d build it, there wouldn’t be a basement or attic and to send further details. Wright completed the 1800 square foot, three bed, two bath home in 1950 after two years of construction. The Walters lived there for 31 years in the spring through fall, in addition to their other home in Des Moines. In fact, Cedar Rock is one of Wright’s 40 or so “signature houses,” Hund said, explaining that only a few homes he designed earned a special tile signed by Wright himself, signifying his favorite clients. After the home was turned over to the DNR in the 80s, it was funded by the Walter Charitable Trust Fund until 2009. Over time, the state purchased more land, growing the park to include 400 acres, Hund said. After 2009, the cost of maintaining the park was absorbed into the state park budget. Seeing the DNR’s budget restraints, a group of community members formed the Friends of Cedar Rock to support maintenance of the home. Most recently, the group raised around $170,000 to renovate Cedar Rock’s boathouse, which was in desperate need of repair, Reisinger said. Hund said the renovations came at a “serendipitous time,” as this year is the 150th anniversary of Wright’s birth. “I can’t think of a better way to celebrate,” she said. In fact, just a couple days after Wright’s birthday on June 8, the park will open for a special nighttime tour of Cedar Rock for their Strawberry Moon Fundraiser on June 10 from 7 to 9:30 p.m.
QUASQUETON — With shrinking budgets, Iowa state parks increasingly are getting by with a little help from their friends. Cedar Rock State Park, site of a well-preserved Frank Lloyd Wright-designed house, is a case in point. About 50 people turned out on a rainy Saturday to celebrate the $200,000 restoration of the Wright home’s unique boathouse — a project park leaders acknowledged would not have happened without the leadership and determination of the Friends of Cedar Rock. Gipp cited similar friends group contributions to the construction of a visitor center at the Decorah Fish Hatchery (the first Iowa facility to be built entirely with funds raised by a friends group) and the $12 million revitalization of Lake Darling State Park. The boathouse would have continued to deteriorate if the friends group had not raised the money through grants and donations, said Katie Hund, site manager at Cedar Rock, the state-owned estate built by Wright for Lowell and Agnes Walter in the early 1950s. “These public-private partnerships, with extensive local community involvement, are key to preserving the heritage of our state parks,” said Todd Coffelt, chief of the DNR Parks Bureau. Hund said the boathouse, with its overhanging roof and cantilevered construction, is one of only five such structures designed by Wright and the only one in its original condition. It echoes key features of the main house, which sits at the opposite end of the limestone spine known as Cedar Rock. While the house had been well preserved, deferred maintenance and prolonged exposure to the elements had degraded the river pavilion, which features a fireplace, sleeping and lounging quarters, boat storage and launching facilities and a deck overlooking the Wapsipinicon River. About 6,000 deteriorated bricks were replaced during the restoration last August and September. Workers also replaced much of the building’s concrete exterior and refinished the walnut woodwork in the room that served as Lowell Walter’s office. Hund said Walter considered the boathouse his personal retreat and spent time there relaxing and making phone calls to the tenants of the 5,000 acres of farmland he once owned in Buchanan County. When he died in 1981, he and his widow Agnes left Cedar Rock to the Iowa Conservation Commission and the people of Iowa. Friends of Cedar Rock President Allison York of Iowa City attributed much of the fundraising effort’s success to grant application writers Jerry and Patty Reisinger of Quasqueton and Carl Thurman of Cedar Falls. They helped secure grants from the state’s Resource Enhancement and Protection program, the Black Hawk County Gaming Association, the Community Foundation of Northeast Iowa and the Buchanan County Community Foundation. Cedar Rock is open to the public Thursday through Sunday from Memorial Day weekend into October. It had been open from Wednesday through Sunday until this year, when budget constraints limited its days of operation. Iowa DNR News Release - - This year, Cedar Rock State Park and other public Frank Lloyd Wright sites around the world will celebrate the 150th anniversary of the famed architect’s birth. Born on June 8, 1867, Wright literally shaped the face of the modern world as an architect, and 150 years later his work is still influential. With their innovation and sustainable design, Wright’s structures serve as inspiration for modern architects and designers. Originally the retirement estate of Iowa businessman Lowell Walter and his wife, Agnes, Cedar Rock was donated to the State of Iowa in 1981. The Wright-designed residence lies on a limestone bluff overlooking the Wapsipinicon River near Quasqueton in Buchanan County. The Walter house was finished in 1950 and is one of Wright's most complete designs. Nearly everything at Cedar Rock bears the architect's imprint, including its interior furnishings. Besides the home, Wright-designed facilities at the park include the one-of-a-kind River Pavilion, council fire and a formal entrance gate. Cedar Rock is one of nine Wright-designed residences in Iowa, but is the only one chosen by Wright to bear his coveted signature tile. Hund is proud of the fact that, in April, the park was visited by CNN "Travel." A crew spent time filming the historic estate as part of an upcoming segment commemorating Wright and the 150th anniversary. 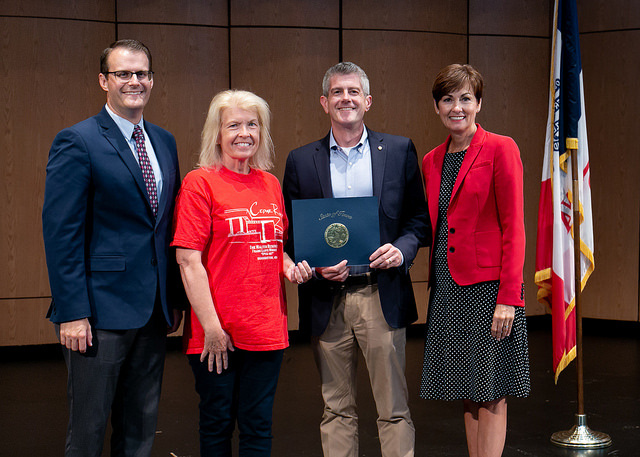 This week, Hund also welcomed Iowa Tourism Office representatives, there to recognize Cedar Rock State Park for its contribution to the state’s $8.06 billion tourism industry. The River Pavilion at Cedar Rock State Park is one of only five Wright-designed boathouses and the only one existing as originally designed. The Cedar Rock boathouse and rock outcropping are landmarks on the banks of the Wapsipinicon River. Over the years, flooding, weather, vandalism and age took their toll on the unique structure. In 2016, through various funding sources and donations, the River Pavilion was restored. The Iowa DNR and the Friends of Cedar Rock invite the public to attend a restoration celebration, Saturday, May 20 from 1:00 - 3:00 p.m. Celebration remarks will be made at 1:30 p.m. Light refreshments will be served, and the house and grounds will be open for those attending. The Friends of Cedar Rock will celebrate 150 years of Frank Lloyd Wright at their annual Strawberry Moon Evening, Saturday, June 10. This special evening allows guests the chance to experience the Walter residence after hours. The public is invited to explore the rarely open Maid’s Quarters and the newly restored River Pavilion, and stroll through the house meander to relax by a fire at the Council Fire. The Friends of Cedar Rock group requests a free-will donation for the event, with all proceeds used to help support Cedar Rock State Park. Lecture symposium featuring speakers on Wright and his work, 1:00 p.m. The Friends of Cedar Rock are pleased to announce the grand opening of the newly restored river pavilion. The structure, designed by Frank Lloyd Wright, recently underwent a $200,000 restoration project to preserve the two-story boathouse and restore it to its original state after years of deferred maintenance. The river pavilion at Cedar Rock State Park is truly unique as it is one of only five realized boathouses of Wright’s 500 structures. Cedar Rock is the only designed Wright residential boathouse that still retains its originality. Flooding, weather, vandalism and age took their toll on this unique and amazing structure over the years, but through the dedication of the Friends of Cedar Rock, the Walter Charitable Trust, and the Iowa DNR this River Pavilion looks "Wright "again. The Friends of Cedar Rock worked diligently for several years securing donations, grants and funding for this project. The group received funding for this project from REAP’s Historic Resource Development Program (HRDP), Black Hawk County Gaming Association, Community Foundation of North East Iowa, Buchanan County Community Foundation, and group and individual gifts. They also received funding from the Walter Charitable Trust and the Iowa DNR. The boathouse is one of the structures that make up the Walter and Agnes Lowell estate at Cedar Rock. Completed in 1950, the home is a unique example of complete Usonian-era work by Wright, featuring brick walls and an interior decorated with the architect’s furniture- he even picked out all the draperies. The celebration will take place Saturday, May 20 from 1:00 p.m.- 3:00 p.m. with dedication remarks at 1:30, at Cedar Rock State Park 2611 Quasqueton Diagonal Blvd, Independence, Iowa. Light refreshments will be served. The event is open to the public. Frank Lloyd Wright loved Wisconsin. But a project in Quasqueton, Iowa, gave the architect a unique opportunity to reflect the Midwest landscape from multiple dimensions. At what’s known as the Cedar Rock House, he designed a series of structures that anticipated how the owners would enjoy and appreciate the landscape, including a standout Usonian house. A $220,000 restoration project currently underway, seeking to preserve and protect the property’s two-story boathouse, is bringing a small but significant part of Wright’s vision back from decades of deferred maintenance. The Cedar Rock boathouse, which sits on the Wapsipinicon River, was the property of Lowell and Agnes Walter, who retired in the 1940s and enlisted Wright to create a perfect home for their twilight years. Using profits from Lowell’s Iowa Road Building Company and real estate investments—the Walters smartly bought up acres of prime local farmland—they were able to present the architect with an 11-acre riverfront site in Lowell’s hometown. The couple asked the architect to design a residence that would best showcase the natural advantages of the site. Swamped with work when he received the offer, Wright said he’d just sketch something without visiting Iowa, but Lowell and Agnes eventually convinced him otherwise. Wright would visit, get inspired, and even stop by during construction; archival photos show Wright demonstrating the best way to lay bricks to local contractors. Completed in 1950, the home was a unique example of complete Usonian-era work by Wright, featuring brick walls and an interior decorated with the architect’s furniture (he even picked out all the draperies). The "tadpole" shaped house—a central cluster of living rooms attached to a long hallway of bedrooms—features a celebrated garden room ringed in three glass walls, which offered wide-angle views of the surrounding countryside. "There’s something really special about the garden room at Cedar Rock, the way he brings the outdoors into the house just touches people," says Kathryn Hund of the Iowa Department of Natural Resources, who manages and oversees Cedar Rock. "There’s a quote where Wright talks about the building growing from the site, and I agree. I looks like it just grew from the ground.The boathouse site about 100 yards from the main building on the opposite end from the home on a limestone outcropping that gives the estate its name. A miniature version of the house that mirrors its flat roof and profile, the tiny space provided an escape for Lowell. Some have called it a Wrightian version of a man cave: the two-story structure contained a garage-like space for Lowell’s custom wooden motorboat, gear, and canoes, as well as a second floor space with a bed and desk. There’s both an indoor working space, fireplace, and screened-in porch. The boathouse is just one of the other outdoor spaces Wright designed at Cedar Rock that made the landscape, the primary selling point, more enjoyable and accessible, according to Alison York, President of Friends of Cedar Rock, the local organization that helped fund the restoration. "There’s a council fire, a large fireplace with a built-in bench, and then boathouse down below by the river," says York. "The structures really let the owners interact with the site." Frank Lloyd Wright designed other boathouses in his career, but the one at Cedar Rock stands out as being the only one designed in concert with the main residence, as well as an original that’s still standing; a similar project on Lake Delavan in Wisconsin burned down. The push to restore the boathouse project started in 2009, when a Department of Natural Resources engineer noticed the the building was leaking and was in dire need of work. When Lowell passed away in 1981, Agnes donated the Cedar Rock house and all 11 acres to the state, which placed it under the purview of the Department of Natural Resources, and set up a trust fund to pay for the upkeep of the home. But beginning in 2009, the state began to pick up the tab for maintenance. After Iowa funded a roofing project that served as a stopgap to prevent further damage, and began soliciting donations from visitors, the Friends of Cedar Rock, a local non-profit, decided to pitch in and help cover the needed boathouse restoration project. Beginning in 2010, the group raised enough money, and won enough grant funding, to fund a full renovation, which is currently underway and set to finish sometime in September or October. Currently, crews are working on concrete, brickwork, and tuckpointing, and recovering from floods caused by a recent heavy rainstorm. The season at Cedar Rock runs from May to October, so those wanting to check out the new boathouse will probably need to wait until May to see the finished product, since the contractors are racing to finish by the end of October. The boathouse at Cedar Rock under construction in 1949. QUASQUETON — A $220,000 restoration of the Frank Lloyd Wright-designed boathouse at Cedar Rock State Park is to burnish a rare architectural gem. “We are incredibly excited about getting it back to its original condition,” said Katie Hund, site manager at Cedar Rock, the state-owned estate built by Wright for Lowell and Agnes Walter in the early 1950s. The restoration, ongoing for the past two weeks, “will make Cedar Rock a shining example of Wright’s work,” she said. Of the few boathouses Wright designed. Lowell Walter’s “man cave,” as she calls it, is thought to be the only one in its original condition, she said. Lowell Walter considered the boathouse his personal retreat and spent time there relaxing and making phone calls to the tenants of the approximately 5,000 acres of farmland he once owned in Buchanan County. Hund said the pavilion housed Walter’s wooden boat, powered by a 33-horsepower outboard, that was capable of 30 mph in an era when that was fast. “He liked to pick up friends at the park in Quasqueton and take them upriver in the boat to play cards in the pavilion,” she said. While the house itself remains in good repair, deferred maintenance and exposure to the elements have degraded the elegant brick pavilion that features a fireplace, sleeping and lounging quarters, boat storage and launching facilities and a deck overlooking the scenic Wapsipinicon River. The boathouse, with its overhanging roof, cantilevered construction and Wright-designed furniture, echoes key features of the main house, which sits at the opposite end of the limestone spine known as Cedar Rock. Workers are restoring the building’s brick and concrete exterior and refinishing the walnut woodwork inside the boathouse. Completion is expected in September, according to Josh Smyser, owner of TNT Tuckpointing and Building Restoration of Stockton, the lead contractor on the project. Smyser said about 6,000 deteriorated bricks are to be replaced as part of the restoration. “This is our first Wright project,” said Smyser, whose company specializes in restoring historic structures, including Terrace Hill, the governor’s mansion in Des Moines. Hund said watching workers pump concrete through an extensive set of pipes to the remote site made her wonder about the labor involved in the original construction. Restoring the boathouse has been the top priority of Friends of Cedar Rock, a volunteer support group that has raised most of the money for the project through grants, donations and special events. Hund said the friends have secured grants from the Buchanan County Community Foundation, the Community Foundation of Northeastern Iowa, the Black Hawk County Gaming Commission and the state Resource Enhancement and Protection program. The largely depleted Walter Charitable Trust has also contributed $50,000 to the project, she said. The trust fund, which consisted of two bequests totaling $1.5 million, covered Cedar Rock’s expenses from 1982, the year the Walters bequeathed it to the state, until 2009, when the Department of Natural Resources assumed most of the site’s operating expenses. The park hosts about 10,000 visitors a year, many of whom come to see Wright’s handiwork and have donated to the boathouse restoration fund, Hund said. It appeals to people with diverse interests ranging from engineering and architecture to woodworking, Iowa history and scenic beauty, she said. The Walter Residence at Cedar Rock opens for the season. Experience Frank Lloyd Wright by touring one of the best examples of his Usonian style. Cedar Rock is one of just 19 signature properties designed by Wright, and the only signature property in Iowa. Open Wednesday through Sunday 10 a.m. to 3 p.m. through October. QUASQUETON — A $200,000 restoration of the Frank Lloyd Wright-designed boathouse at Cedar Rock State Park will get underway this spring. “We call it the man cave,” said Katie Hund, site manager at Cedar Rock, the state-owned estate built by Wright for Lowell and Agnes Walter in the early 1950s. “The boathouse was Lowell’s personal retreat, a place where he could get away and relax,” Hund said. While the house remains in good condition, deferred maintenance and prolonged exposure to the elements have degraded the elegant brick pavilion, which features a fireplace, sleeping and lounging quarters, boat storage and launching facilities, and a deck overlooking the scenic Wapsipinicon River. The contract, awarded to Eugene Matthews Inc. of Broadview, Ill., calls for restoring the building’s brick and concrete exterior and refinishing the walnut woodwork inside the boathouse. Completion is expected in October. Restoring the boathouse has for several years been the top priority of Friends of Cedar Rock, a volunteer support group that has raised most of the money for the project through grants, donations and special events. “I don’t see how this could have happened without the Friends,” said Hund, who noted they secured grants from the Buchanan County Community Foundation, the Community Foundation of Northeastern Iowa, the Black Hawk County Gaming Commission and the state Resource Enhancement and Protection program. Hund said the largely depleted Walter Charitable Trust will contribute $50,000 to the project. The house and boathouse together “form a wonderful ensemble,” said Friends member Carl Thurman of Cedar Falls, who drafted the grant proposals. Although Wright designed several boathouses, the Cedar Rock pavilion is the only one whose construction was overseen by Wright that remains standing, according to Thurman, who has visited all the Wright-designed structures open to the public in the United States.